If Pixar's Inside Out and Disney's Zootropolis showed how to immerse audiences in boldly envisioned worlds, Sony's animated kids' dud is an abject lesson in how not to do it. The seeds of a clever satire might lurk in the idea of a city of emojis living in your smartphone, but co-writer and director Tony Leondis (Igor) fails to nurture them. 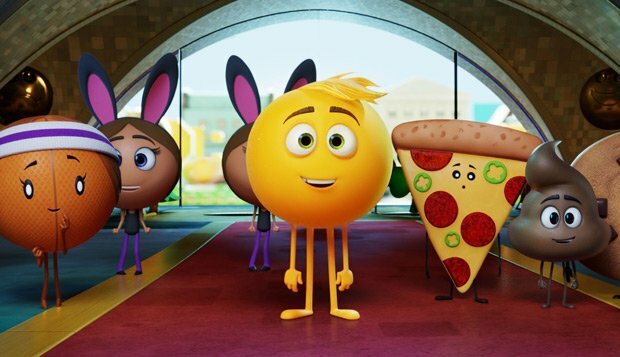 Unfunny and unengaging, The Emoji Movie combines product placement, ingratiating voice-work and barrel-scraping studio desperation, all while having the gall to peddle a 'be yourself' message. The crux of that message is Gene (voiced by TJ Miller), a 'meh' emoji living in Textopolis who flunks his intended function on day one at work by displaying mixed emotions. Targeted for deletion by perma-grinning boss Smiler (Maya Rudolph), Gene goes on the lam with perky emoji Hi-5 (James Corden, overdoing the charm offensive) and hacker Jailbreak (Anna Faris), looking for freedom in the fabled Cloud. Unfolding as a blandly generic journey of self-discovery through a land of garish apps, the result plummets short of its aim to be a Wreck-It Ralph for the OMG crowd. A character anchor to compare with, say, Inside Out's Joy is lacking; Gene is more 'meh' than his supposedly irrepressible vivacity suggests. As for Jailbreak's 'big secret', it takes second place behind box-ticking, thuddingly literal-minded realisations of phone apps as environments: Dropbox involves a fall, Spotify is a stream, Twitter is... guess. Without the wit needed to sharpen these surface fripperies, what could have been a Lego Movie-style, pop-culture-savvy play on modern appetites for distraction appears fatally distracted itself. As for human intrigues, dream on. A real-world plot about lovelorn high-schooler Alex (Jake T Austin) goes no further than the phone shop, where an assistant helps Alex delete his apps. When it comes to deleting Sony's ani-meh-tion from the memory banks, no assistance will be needed. General release from Fri 4 Aug.